activities as cooking classes and horseback riding lessons, without giving up to a chic and well-kept style. Just a kilometer from the blue Ionian sea, Masseria Bagnara welcomes its guests in Lizzano, a pretty town of Salento, at the foot of the Murge Tarantine. The major centers as Taranto,Ostuni and Alberobello are more than 30 km away, while in the nearby of the Masseria the you can visit Pulsano, Campomarino and Maruggio. The farm is situated in an exclusive oasis, offers fascinating views of olive groves, vineyards and the surrounding countryside. 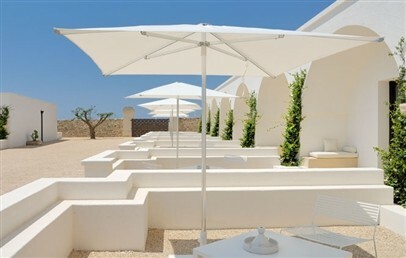 Masseria Bagnara provides the perfect holiday between the sea and the countryside of Puglia. Skilfully restored, the Masseria Bagnara is an old farmehouse which respects the environment, the original spaces and the personality of the whole structure. It is characterized by white walls and local tuff and consists of a Spa, 15 rooms, a restaurant and a garden with swimming pool and solarium. All rooms are finely decorated and furnished in modern style. They are equipped with minibar, LCD TV with satellite channels (in different sizes depending on the room), free internet Wi-Fi connection and walk-in closet, digital safe and luggage storage area. Hystorical Room (18 sq.m.) double room with bath with shower, located on the ground floor and built inside an ancient Trullo, private garden. Deluxe (36 sq.m.) is located on the ground floor, consists of double bedroom with queen size bed, bathroom with shower, small veranda. 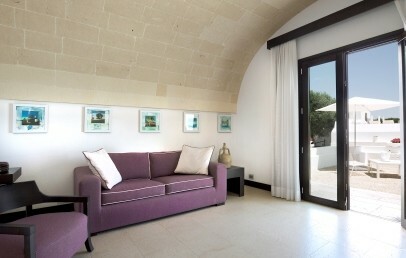 Superior - Double room without patio, situated in the most ancient part of the Masseria. Junior Suite is located in the ground or first floor and consists of double bedroom with queen size bed and sitting area, bathroom with shower or with tub and shower, balcony or patio. Junior Suite Pool (48 sq.m.) is located on the first floor, double bedroom with queen size bed and Living area, bathroom with tub/shower, big terrace with private whirlpool. 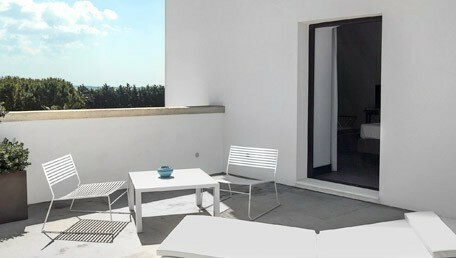 Suite is located in the ground floor and has the entrance from two solarium directly to the living room with sofa bed. It consists also of a double bedroom with queen size bed and bathroom with shower. Executive Suite is located on the first floor with two bedrooms, large living room with sofa bed and bathroom with tub. The relaxing Spa of the Masseria follows a strong wellness philosophy. It presents a large Jacuzzi, multi-sensory showers , a hammam and offers a wide range of personalized treatments. The Restaurant of the Masseria Bagnara offers a traditional cuisine reinterpreted by the creative Chef. The breakfast is a buffet and for dinner it has every day a new menu with different courses with fresh and seasonal ingredients and with the choice of meat or fish (from June to September). To crown the palate, di Masseria provides an excellent wine list with fine labels, consisting almost exclusively with wines from the region. Prestige bottles of the best wine cellars are deliberately combined with the Mediterranean delights of chef. The outdoor swimming pool is located in a panoramic area with solarium. The hotel also offers boat trips, horseback riding lessons or excrusions in the nearby countryside. Moreover it can be organized wine tastings, culinary experience, olive oil tasting and local delicacies. 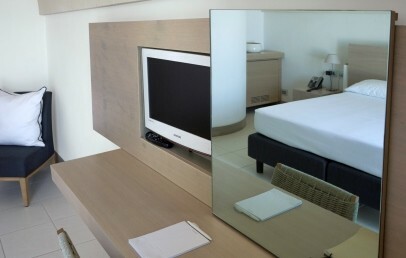 Located in the ground floor, the Deluxe room are finely decorated and furnished in modern style. They consist of a double room with queen size bed and a lounge area with armchairs. 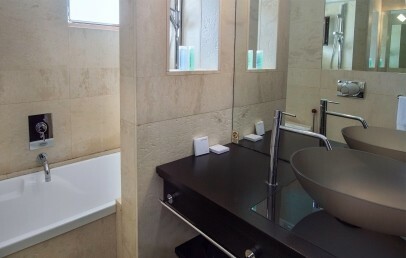 The bathroom is composed of two rooms, one with sink and shower, the other, with the toilet unit. Located in the ground or first floor, the Junior Suite room are finely decorated and furnished in modern style. They consist of double room with queen-size bed, desk and chairs and lounge area with armchairs. 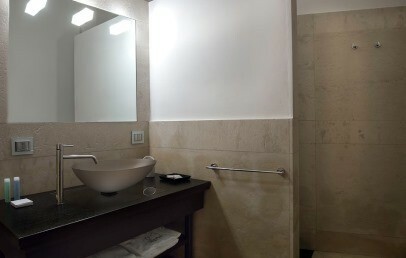 The bathroom provides sink, shower and the toilet unit. Located in the ground floor, the Suite room are finely decorated and furnished in modern style. They have an entrance with 2 solarium connected to the living room which has a sofa bed, armchairs, desk and chairs. They consists also of double room with queen-size bed, walk-in closet. 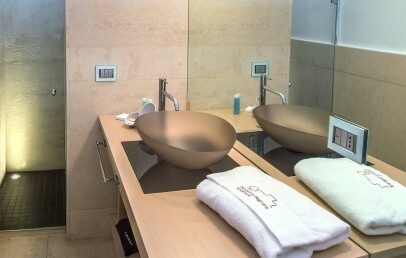 The bathroom is composed of two rooms, one with sink and shower, the other, with the toilet unit. 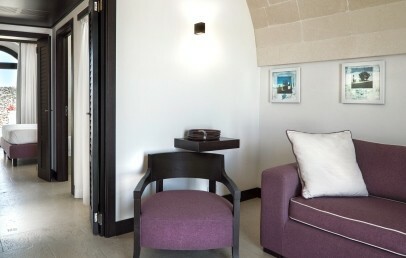 Located in the first floor, it is the exclusive Suite of the Masseria. It is finely decorated and furnished in modern style. It consists of living room which provides a sofa bed, armchairs and desk with minibar. There are 2 double rooms with queen size bed and a walk-in closet. The bathroom has the tub with shower head. This room is unique and furnished in modern style. 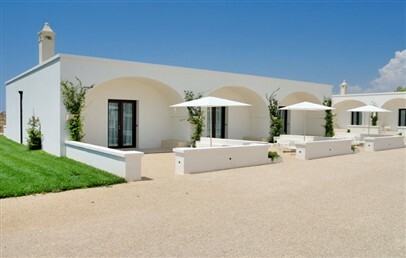 It is located on the ground floor of the Masseria and was built inside an ancient Trullo of the Salento. The bedroom is ideal for only two people. The bathroom has a shower. The room has a private, equipped garden area. This Junior Suite is finely decorated and furnished in modern style and is located on the upper floor. It offers a night and a day zone and a nice terrace of approx. 50 sqm with private whirlpool, where guests can fully enjoy and have the possibility to dine. The bathroom has a tub with shower. Double room without patio situated in front of the cave; it is bigger than a deluxe room but without any patio and has a single French window (the only natural lighting point). 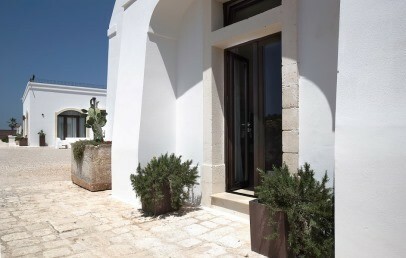 Situated in the most ancient part of the Masseria. 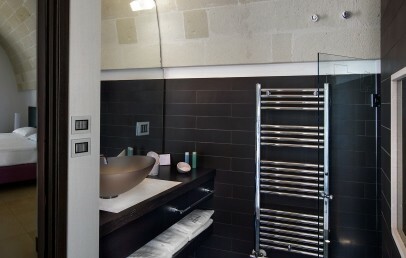 Bathroom with shower, parc vue. Long Stay - Book 3 nights and the last night is free of charge!